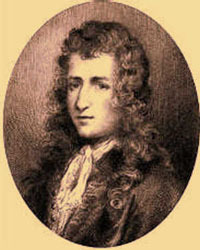 Robert Cavelier, Sieur de La Salle. 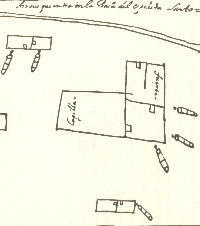 Spanish map of the French settlement, showing positions of eight cannons. The drawing was made by members of the De León expedition, who discovered the ruined "fort" several months after it had been ransacked by the Karankawa Indians. The Spaniards burned the buildings and buried the cannons, intending to use them sometime in the future. Map confusion. 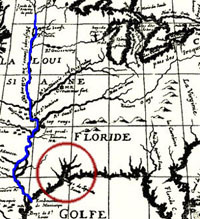 Early French map showing the charted course of the Mississippi River (denoted as a blue line) and its actual mouth (outlined in red) near present-day New Orleans, some 400 miles upcoast from La Salle's landing point. La Salle was hampered by inaccurate maps and navigational devices. 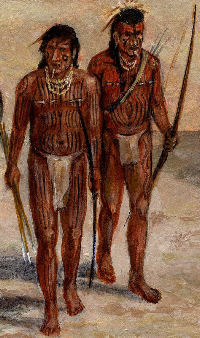 Karankwa Indians had lived in the coastal area for centuries prior to the arrival of the French. The Indians brutally attacked the settlement in 1689, following a series of misunderstandings and news of the death of the French leader, La Salle. Inset from painting by Frank Weir. The multi--year investigation was conducted during typical coastal weather extremes, from drought and heat that baked the soil, to torrential rains that flooded the trenches and excavation units. Photo courtesy Texas Historical Commission. Reminders of French, Spanish and Indian lives at Fort St. Louis and the presidio site. These artifacts are among some 150,000 recovered during THC and UT-Austin investigations. TARL Collections. Photo by Susan Dial. 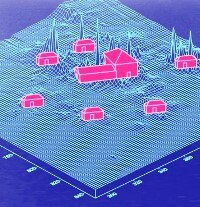 Depiction of French buildings overlying map of French artifact concentrations, indicated by spikes. These and other interpretive graphics by the Texas Historical Commission help us understand the complex archeological site. See Traces of French, Spanish, and Indian Lives for additional examples. 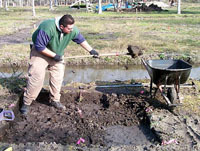 French and Spanish re-enactors help bring the Fort St. Louis story to life during Archeology Awareness Month in Victoria, Texas. 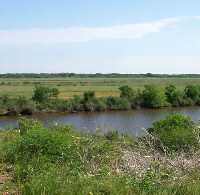 On a bluff overlooking Garcitas Creek in present-day Victoria County, Texas, lies the site of the earliest European settlement on the entire Gulf coast between Pensacola, Florida, and Tampico, Mexico. Most often called Fort St. Louis, through historical error, this meager outpost came into existence not only as the bitter fruit of one man's vision, but also as a manifestation of the three-way struggle for America in the seventeenth and eighteenth centuries. Spain had come early to work its way north and south from the Caribbean Sea and the Gulf of Mexico. England gained a toehold with its colonies on the Atlantic Seaboard. France, utilizing the Saint Lawrence River and other waterways, claimed Canada and the Great Lakes region, then aspired to the center of the continent by possessing its greatest river, the Mississippi. By the strangest of circumstances, France's ambitions led to this tenuous settlement on the Texas coast. Here a beleaguered band of French colonists, brought by the vaunted explorer Robert Cavelier, sieur de La Salle, struggled valiantly, from 1685 to 1689, against the wilderness, the Indians, and an environment that was wholly alien to them. Their numbers constantly diminished, from Indian ambush, from disease, and from eating strange fruits, such as prickly-pear tunas covered with tiny thorns. By the time La Salle left the colony in January 1687 to seek relief, less than 50 colonists remained of the 180 who had landed two years previously. 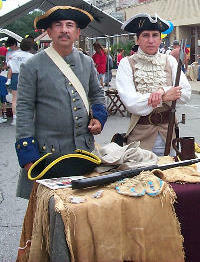 Such was the settlement that has come to be called Fort Saint Louis. In reality, the little colony had no official name. It had none of the trappings usually associated with a fort. There was no palisade, or defensive wall. The eight cannons arranged around a few crude dwellings offered no defense, for there were no cannonballs of the right caliber. Instead of a stronghold, there were only crude huts built largely of wood poles and thatch, plus the headquarters house made of timbers salvaged from La Salle's wrecked supply ship, Aimable. One of the huts, built by the priests, served as a chapel. As described by the Frenchman, Henri Joutel, it was "made of stakes driven into the ground and roofed with grass or reeds." It was the first Christian house of worship on this entire stretch of coast and the first in the present state of Texas that was not situated on the Rio Grande. In this little house of stakes, the first European marriage of record in Texas was solemnized. The only child born of the colony—Texas's first European birth of record—doubtless was christened in this "Church in the Wildwood." The name given this child, known only as "baby Barbier," has not survived, nor is its gender known. Its life was cruelly ended only a few months after its birth. The story of this ill-timed and misplaced effort to establish a French colony is told in part by Joutel, who was La Salle's lieutenant. Joutel, however, left the settlement, with La Salle himself, supposedly to seek relief and rescue for those who remained. The telling of its brutal end—at the hands of the hostile Karankawas—is left to a nine-year-old boy, Jean-Baptiste Talon, one of five children who lived thereafter among Indians, then Spaniards. The colony had come into being as part of the most daring venture of La Salle's career—a career marked by defiance of the odds. The noted explorer had come seeking the Mississippi River, hopeful of placing his colony there. The expedition, however, missed its target by some 400 miles and landed instead on the Texas coast. Told in the following sections is the story of La Salle's vision-some called it a wild dream-that brought the colonists to this miserable place, and how they survived from 1685 to 1689. Here this scant remnant of 180 persons landed by La Salle on Matagorda Island waited in hope for rescue, while no hope came and no messenger came to tell them that there was no hope. In just a few years their settlement would be lost to memory, except for the Spaniards who burned the buildings and buried the eight cannons that had been so devoid of usefulness for the colonists. In time, other Spaniards came to establish a fort on the same site, obscuring in the process many of the "footprints" left by the French. These Spaniards also came and went and, eventually, their post, too, was lost to memory. 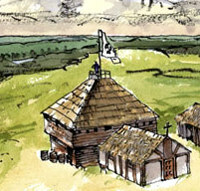 Modern historians searching for the fort indulged themselves in a variety of wrong guesses, even after the La Salle site had been identified—tentatively but accurately—and even after a preliminary archeological study had found an impressive array of French artifacts amid a larger number of Spanish relics. It was the remarkable discovery of La Salle's eight cannons that set archeologists from the Texas Historical Commission to work, uncovering the buried secrets of Presidio Nuestra Señora de Loreto de La Bahía on the site of the so-called Fort Saint Louis. There, too, were artifacts by the thousands to help flesh out the well-recognized historical drama, and the poignant discovery of three skeletons—apparently those of French settlers killed by the Karankawa and later buried by the Spanish. Studying those fragmentary remains, a forensic anthropologist was moved to write a short tribute to the massacred settlers, echoing the pathos of the Spanish soldier who discovered and memorialized them in an elegy three centuries earlier. The sections following bring these and other stories to light, adding the latest findings from years of careful analysis of the recovered materials. The Visionary La Salle traces the voyages and motives of the French explorer in North America, including his pivotal discovery of the mouth of the Mississippi River. Life and Death in the French Colony details the small triumphs but largely miserable existence of the struggling settlers before the final attack by the Karankawa. Discovery and Investigations details the nearly century-long search for the site of the settlement— first by the Spanish and later by a succession of historians and archeologists—culminating in the multi-year systematic excavations conducted by the Texas Historical Commission. 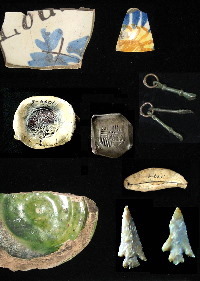 Traces of French, Spanish, and Indian Lives presents interactive graphics and maps of the archeological findings and galleries of the artifacts from both University of Texas and THC excavations, many never seen before by the public. A Teachers Lesson for 7th-grade students focuses on using the wealth of primary sources—historic maps, journals, and reports—to chronicle the events that played out at the site. Credits and Sources provides further links and references to learn more about this saga in Texas history. A companion exhibit on Texas Beyond History, The Belle Shipwreck, offers more information about La Salle in Texas and the exciting discovery of the shipwreck in Matagorda Bay. An exhibit on Mission Espiritu Santo traces the story of the Spanish efforts to christianize the local Karankawa and other coastal Indians, first at the site guarded by the presidio on Garcitas Creek , and then at three subsequent locations in south Texas. 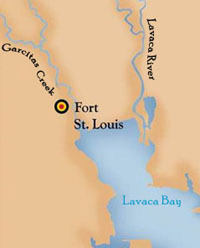 Location of La Salle's settlement now known as Fort St. Louis. Established roughly 40 miles inland from where the French expedition landed on the Texas coast, the site was intended only as a temporary outpost for the colonists while La Salle continued searching for the mouth of the Mississippi River. Enlarge to see other locales pertinent to the story. Map by Roland Pantermuehl, courtesy of the Texas Historical Commission. The tranquil Garcitas Creek today belies the dramatic events that played out at the site of La Salle's ill-fated colony. Then known as "Riviere aux Boeufs," in reference to the many buffalo that roamed the grassy prairies, the brackish creek saw French settlers struggling to exist in a foreign wilderness amid hostile natives. Photo courtesy Texas Historical Commission. La Salle's two-story "headquarters" building and small chapel, the first Christian house of worship in Texas not situated on the Rio Grande. Here the first recorded European marriage in Texas took place, and perhaps the first European birth solemnized. Inset from painting by Charles Shaw, courtesy of the THC. Although it lasted less than four years, La Salle's small settlement on the Texas coast had a major impact on the 17th-century political scene, as three major powers vied for territory in North America. When the Spanish learned of La Salle's colony, they launched a “search and destroy” expedition to find the intruder and prevent future French claims in New Spain. In the years following, they built a series of presidios, missions, and villas in south Texas as a show of strength and to solidify their claims for Spain. 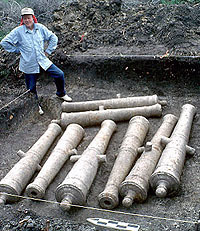 French cannons, buried by the Spanish at Fort Saint Louis in 1689, were uncovered on a private ranch in Victoria County by archeologists from the Texas Historical Commission, finally confirming the site's identity. Standing in the unit is the late Curtis Tunnell, former THC Executive Director. Photo courtesy of the THC. THC archeologists discuss artifacts found at the site with visitors. 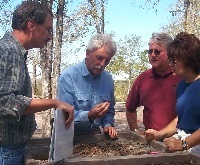 From left, THC Principal Investigator Jim Bruseth; Project Archeologist Mike Davis; Senator Kenneth Armbrister and his wife, Suzie Armbrister, of Victoria. Mrs. Armbrister grew up about a mile from the site. Photo courtesy THC. 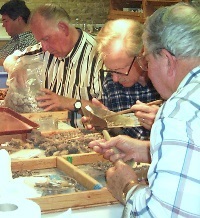 Local volunteers processed thousands of artifacts at the Victoria College laboratory. This effort still continues at the Museum of the Coastal Bend, which hosts an interpretive display of Fort St. Louis. Some of the most valuable information we have about Ft. St. Louis can be found in the journal of La Salle's trusted lieutenant, Henri Joutel. After La Salle was murdered in 1687 by his own men, Joutel made his way to Canada, and from there, to France, taking his notes with him.